A plane crash involving a light tourism aircraft has killed five people among whom three French citizens and a Swiss near the Portuguese capital, reports say. 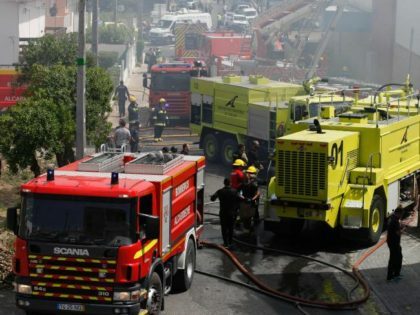 All the passengers on board plane died in the crash after the aircraft licensed in Switzerland hit warehouse of a supermarket, not far from an airfield in the region of the Portuguese capital, AFP report citing local officials. “Victims inside the plane were three French and a Swiss,” said André Fernandes, the commander of the Civil Protection of the region of Lisbon region. Fernandes also noted that the aircraft on hitting the warehouse killed one person inside and wounded slightly three other people. The injured were shopping in inside the supermarket and were treated for shock and smoke inhalation, Associated Press reports. The aircraft; a twin-engine Piper PA-31 Navajo, 10 meters of length, took off from the small Tires airfield, 20 kilometres west of Lisbon in direction to Marseille, in the South of France, AFP adds. Dozens of firefighters were rushed to scene to put off the fire caused by the crash.